First Update the software to 1.6.x. Mac software bought from the Mac App Store (MAS) is updated through the MAS update tab. Windows software can be updated by running the App and pressing Download when prompted about the newer version. IF YOU CANNOT SEE THE SCROLLING OFFER, you will need to give your software firewall clearance in order to see the pages that looks like these attachments. On Windows you may also need to install Internet Explorer 10 or above. Some customers report they have needed to disable VPN networks . If that does not work and you are using the purchased version (not trial or beta) then please add to this thread and we will try to help. 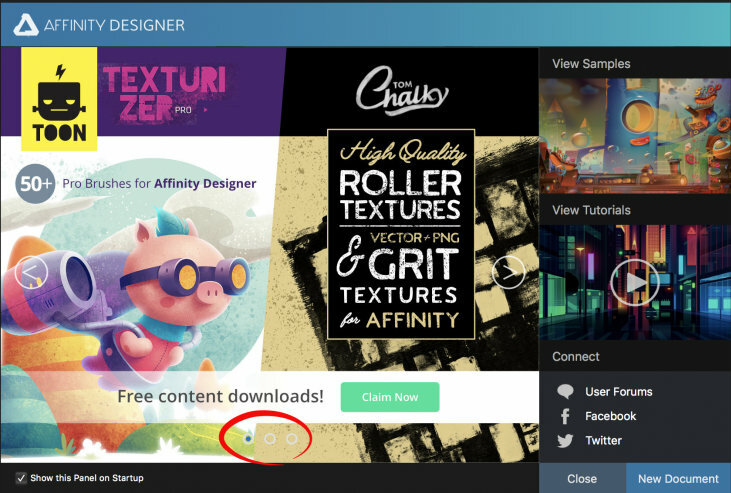 Once you have clicked on the "Claim Now" in the software Welcome screen you will be taken to the Affinity Store (a shopping basket on our website) called "Your Order Summary", from which you can claim your content. 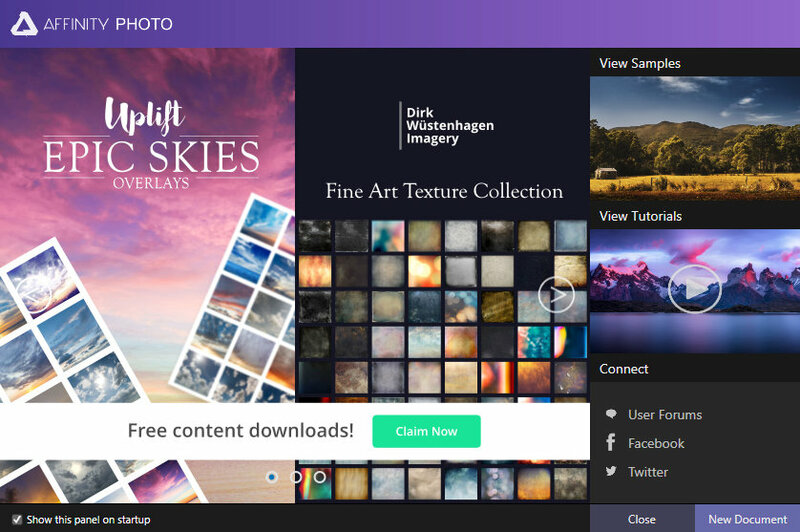 Simply make an account by using the "NEW TO AFFINITY?" option on the store as you claim your content. 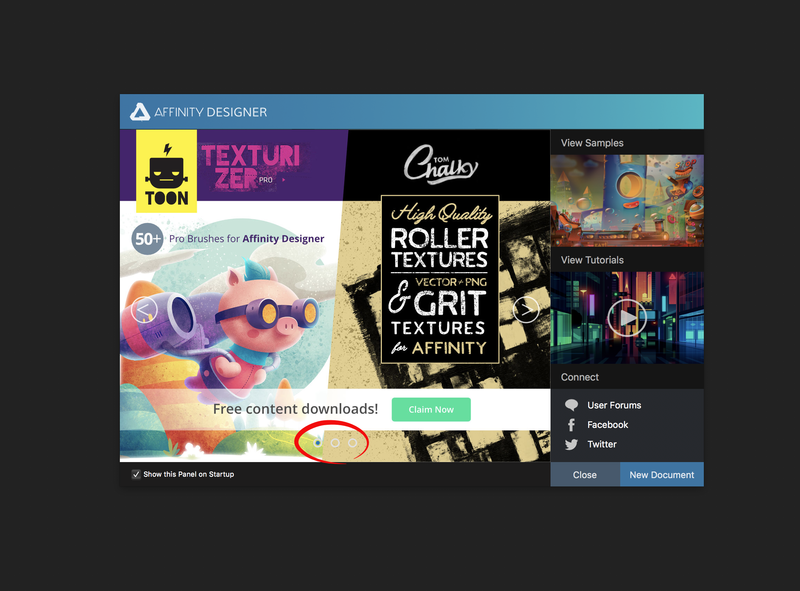 (If you happen to have an account the New to affinity option will tell you anyway, so everyone can use that option) The free content will be added to the Downloads Section of your account and can be seen in future in your Affinity Store Order History. 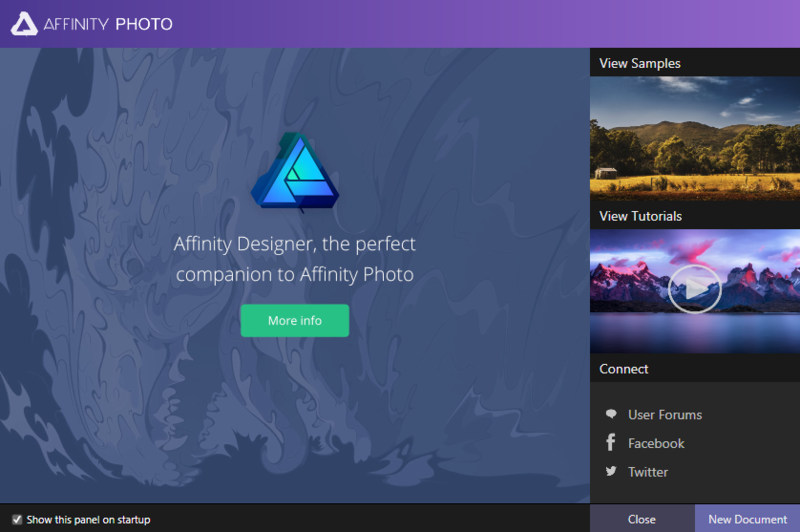 You will ONLY have an Affinity Store account if you have bought the Windows version of Affinity Designer or the Windows version of Affinity Photo or the Affinity Designer Workbook from our site Affinity.Store. 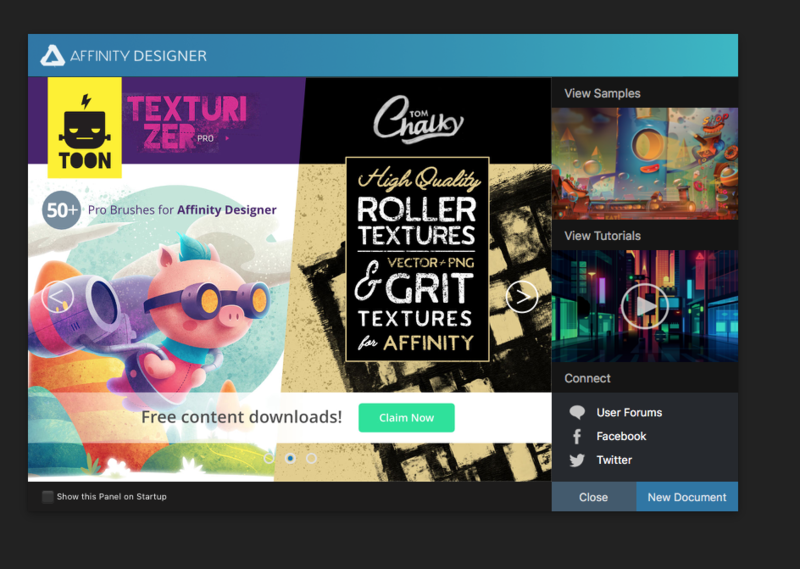 If you bought the Mac version from the Mac App Store you need to create an Affinity Store account to claim the free content. Purchases from the Mac App Store (MAS) are ONLY in Apple's database and Affinity Mac owners DO NOT have an automatic Affinity Store account. 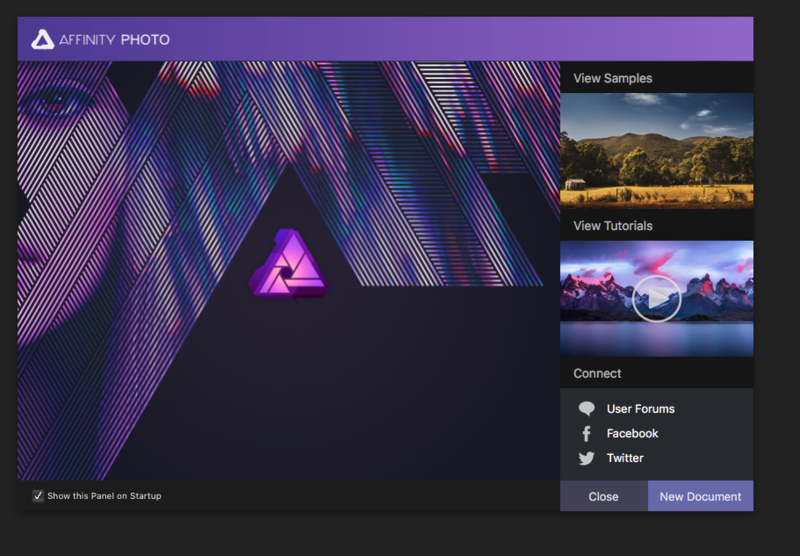 A forum account is not an Affinity Store account, so if that's all you have you will need to create an account too. A Serif legacy account (used to buy the Plus range) is NOT an affinity store account, the databases are 100%independent. 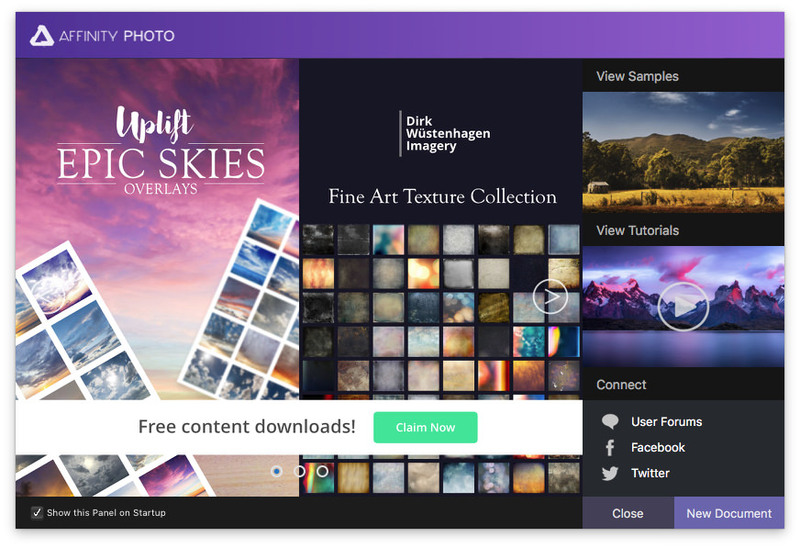 Is it correct to assume that the free macro pack and Grade UI are the same versions as were freely available before? Yes, as far as i know there's no changes here. Go to menu Help ▸ Welcome.... There a link there to claim the extras. First, thanks for the upgrade!! I've just installed both and will play tomorrow. However: I don't see any link to claim anything? Just the standard View Samples/Tutorials and Connect, close and New Document and in Photo a more info link about Designer. You must be connected to the internet for the Welcome Screen pages update. The Welcome screen will scroll through several different welcomes. The first option is the one you're looking for. The link for free content on my Mac 'Designer' provides a link to the store and is as advertised in the received email but the 'Welcome' page is void of similar links on my Mac Photos 'Welcome' page. Is the link somewhere else in Photos ? I seem to be having problems getting the freebie stuff. Problem is I receive updates via the Mac App Store but receive newsletters and have signed up to these forums using another email addie. Tried both entering info from my Mac App Store login and forum login for the downloads, no go. I then tried to reset my password but have yet to receive an email back on how to go about it. So, unless you guys are swamped in resetting passwords requests, I am wondering, do I have to create yet another Affinity account with a different password, entirely different from my Mac App Store, and Affinity forum ones? Do I need to reboot or something? Do you have any program that may be blocking Affinity's connection like anti-virus/firewalls etc? I am having the same problem. I try to use the exact log-in info I have always used, but now the site claims it is incorrect. When I try to reset the password, it tells me to follow the instructions in the email being sent. But there is NO email that is ever received! I have looked in the spam folder and there is nothing there either. links on welcome screen where? I get updates through Mac Store. Have this account for forum. How do I go about authorizing the downloads? I turned my firewall and antivirus off but still no change. I cannot download update from my account. Nothing happens after i click download. Server is full? How else i can download installation file for Photo for Windows? Run Affinity Photo. You should receive a notification telling you that there's an update available along with a download button. Click the download button to be directed to a webpage from where you can download the installer. I installed the Photo 1.6 update, but I don't see any links to the bonus content. 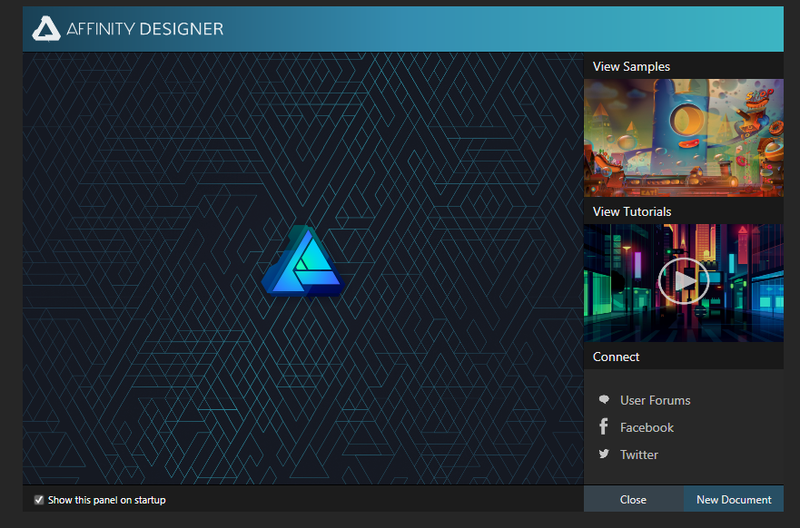 My welcome screen is only about Designer. Go to menu Help ▸ Welcome Screen... and scroll through the horizontal slider using the dots on the bottom. One of the pages (usually the first when you open the Welcome Screen) has a link to claim the extras. Make sure you have an internet connection active and that the program is not being blocked by an anti-virus or firewall. Mac users will have to create an account in the Affinity Store to complete the order and download the extras (assuming they haven't bought the Affinity Designer Workbook in the Affinity Store otherwise they already have an account there - just sign-in with your credentials). Windows users just need to enter their existing login credentials since they already have an account (created when they bought the app). I just entered my existing email and password on the "create new account" option and since the store is acting like my previous account does not exist, it didn't tell me those were already in use, and I was able to check out with the free extras. Weird, but at least it worked. Is it also correct to assume that the Texturizer Pro brushes are the same as the ones I bought from @Frankentoon? I don't mind supporting Enrique's great work, but I don't want to waste time and 'bandwidth' downloading another copy of exactly the same set! I don't know if they are the same or were updated for 1.6, sorry. I will try to find out.